Four years ago, 22-year-old student Rimma* started treatment for tuberculosis (TB). As the bacteria became increasingly resistant to treatment, the drugs she had to take were harder to stomach. 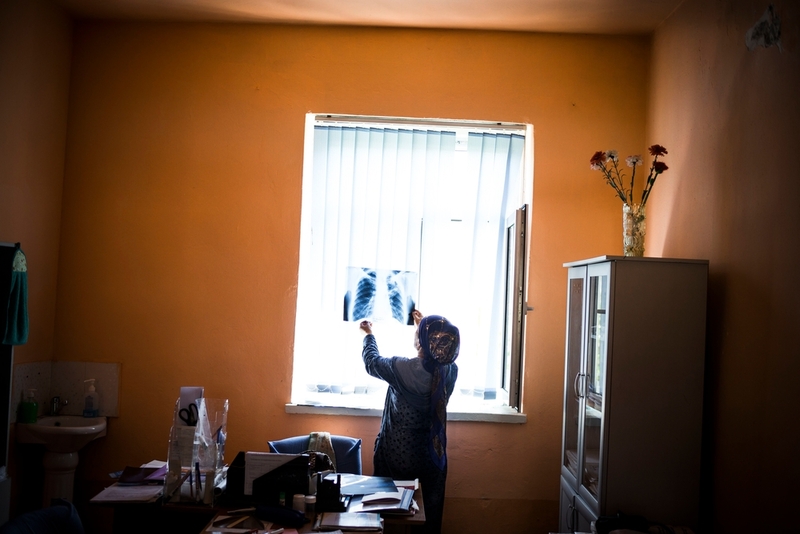 Finally, after joining MSF’s programme in Kara-Suu, Rimma became MSF’s first patient in Kyrgyzstan to be cured of the disease on the regimen with new drugs. She tells her story. “I was 18 and studying at college when I was diagnosed with tuberculosis (TB). It turns out that someone from my college was sick, so seven or eight people ended up getting TB, and I was one of them. I never found out who it was. With flu, I normally get a bad cough, so when I got sick I thought it was no different. But after a few weeks the cough got worse, so I went to the doctor. After an X-ray, I was told I had TB and was immediately admitted to a TB hospital. Two weeks into the TB treatment, they found out that the strain of TB I had was resistant to the usual drugs. I spent three months in the multidrug-resistant tuberculosis (MDR-TB) ward before starting outpatient treatment. After six months of outpatient treatment, I came down with hepatitis because of all the drugs I was taking. The doctors stopped the drugs for two weeks to give my liver a rest, but after that I just couldn’t take any more medication. Every time I looked at the pills, I felt sick. I couldn’t even hold my food down. For the next few months I didn’t take my medicine – I didn’t want to. I interrupted the treatment. And slowly I started losing weight, my cough came back, I had headaches – all the symptoms were starting up again. Still I refused to go and see a doctor. But after a few months like that I ended up in hospital again. Just when I was expecting to start outpatient treatment, the doctors told me they couldn’t give me any more drugs as I’d been on treatment for two years already. I begged them to provide me with treatment for a few more months, and then I was told that MSF had a similar programme for people with multidrug-resistant TB. So I went to see MSF. The MSF doctor asked me repeatedly if I’d stick with the treatment. I guess my history of interrupted treatment was known to them. When I saw the doubt in the doctor’s eyes, I promised myself that I wouldn’t interrupt the treatment again – that I’d do anything to continue the treatment. A doctor checks a patient x-ray in her office at one of Kara-Suu's TB Cabinets. Kara-Suu region. File image. Two weeks later I got the news that my MDR-TB had become extensively drug-resistant TB (XDR-TB). The treatment for it gave me bad side effects. I used to vomit, I had severe headaches, even my legs hurt. I wasn’t able to sleep. There was one pill that turned my skin very dark – I looked tanned, but not in a healthy way. And I put on weight, gaining around 10 kg. People who didn’t know that I was sick kept asking me why I’d got so fat and what had happened to me. I had to wear glasses and hats so that people wouldn’t recognise me. Back when I was 18 and I was first diagnosed with TB, I cried and was depressed for about a month. I couldn’t talk to anybody. I kept asking: ‘Why me?’ I thought my life was over. I was supposed to have been cured a long time ago. Since then I’ve seen a lot of people die from TB. And that’s why I decided that I only had one option, and I chose to fight because I wanted to live. Something like TB sorts your life out: you know who’s a true friend and who isn’t. Before getting sick I thought everyone was my friend. But only a few of my classmates came to visit, and most of my so-called friends disappeared. I had one best friend. When I was diagnosed she was abroad. I didn’t tell her I had TB – I just told her I was sick. I lied to her because I was scared I’d lose the only friend I had left. But when she came back she understood. She was the only person who stayed by my side.